The hippopotamus is a semi-aquatic ungulate -- animal with hoofed feet -- found in sub-Saharan Africa. It lives in lakes and slow-moving rivers surrounded by grasslands. Though the hippo's name translates to "river horse" in Greek, biologists believe it's more closely related to pigs, whales and dolphins. The hippopotamus is the third largest terrestrial mammal; only the elephant and the white rhinoceros are bigger. Hippopotamuses measure 10 to 14 feet in length and weigh more than 3 tons. Four webbed toes on each foot support their immense bodies. Their eyes, ears and nostrils are positioned on top of their heads, allowing hippos to remain aware of their surroundings while almost entirely submerged in water. 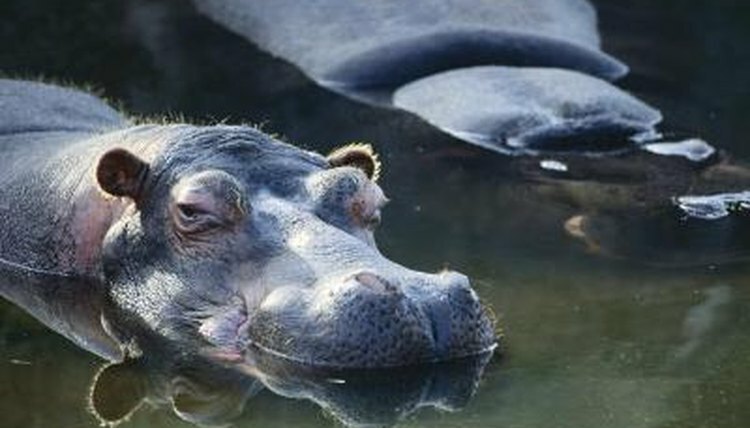 A clear membrane that covers their eyes allows hippos to see underwater. They can also close their nostrils and hold their breath underwater for as long as five minutes. Hippos secrete a red fluid that is often mistaken for blood, but instead protects their skin from the sun. Their hide is gray and thick with very few hairs. A flat tail allows males, or bulls, to mark their territory by flinging and spreading their dung. Hippopotamuses, like all ungulates, are herbivores. More specifically, they're grazers, which means they consume grasses. Hippos feed at night, beginning at sunset, and can graze for more than five hours at a time. They eat approximately 88 pounds of grass -- a fraction of their body weight -- during each feeding session. Hippos can subsist on such relatively small amounts of vegetation due to their mostly sedentary lifestyle. In order to cope with the heat of the African savanna, hippos spend most of the daytime hours immersed in slow-moving waters. They live in herds of 20 to 30 individuals, each of which has a dominant male, or bull. Hippos are considered one of the most aggressive mammals on Earth. Bulls use their ever-growing canines when fighting each other over territory. Despite their size, hippos can run up to 14 miles an hour, though not for very long. The dominant male in any herd of hippos is free to mate with all the females in his group. Mating usually takes place in water. Approximately every two years, after an eight-month pregnancy, a female will give birth underwater to a single calf that weighs around 100 pounds. Newborn calves can close their nostrils and ears, allowing them to nurse both on land and underwater.